Mount Gambier in South Australia is home to 30 popular cave diving sites, but there are two extraordinary sinkholes that have gained international fame. Lying beneath seemingly generic farmland, The Shaft requires expert divers to be lowered through a small manhole in the ground from a metal tripod. Inside, there's an eight metre free hanging drop to the surface of the water, where the cave's diameter is approximately 20 metres. The cave is about 120 metres deep, pitch dark and often described to be like outer space. Scientists often explore its depths to study the marine life and geology. Kilsby's sinkhole (pictured), more visible than The Shaft and approximately 50 minutes away by car, is a limestone cavity that descends to depths of 65 metres. Well-known for its clear waters and unearthly landscapes, it has in the past been used by the government for weapons testing and police force deep dive training. Mount Gambier in South Australia is home to 30 popular cave diving sites, but there are two extraordinary sinkholes that have gained international fame. Lying beneath seemingly generic farmland, The Shaft requires expert divers to be lowered through a small manhole in the ground from a metal tripod. Inside, there's an eight metre free hanging drop to the surface of the water, where the cave's diameter is approximately 20 metres. The cave is about 120 metres deep, pitch dark and often described to be like outer space. 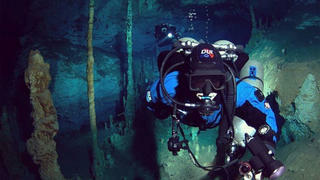 Scientists often explore its depths to study the marine life and geology. Kilsby's sinkhole (pictured), more visible than The Shaft and approximately 50 minutes away by car, is a limestone cavity that descends to depths of 65 metres. Well-known for its clear waters and unearthly landscapes, it has in the past been used by the government for weapons testing and police force deep dive training. One of two inland blue holes in the Lucayan National Park on Grand Bahama Island, Ben’s Cave is one of the most popular among intrepid explorers. Thought to be one of the longest cavern systems in the world, so far more than nine kilometres have been charted. Divers must be accompanied by a certified guide and will be able to see ancient stalactites, stalagmites and fossilised shells. The limestone cavern was also the filming site for James Bond’s scene with a (mechanical) shark in Never Say Never, a great movie location to visit on a luxury yacht. One of two inland blue holes in the Lucayan National Park on Grand Bahama Island, Ben’s Cave is one of the most popular among intrepid explorers. Thought to be one of the longest cavern systems in the world, so far more than nine kilometres have been charted. Divers must be accompanied by a certified guide and will be able to see ancient stalactites, stalagmites and fossilised shells. The limestone cavern was also the filming site for James Bond’s scene with a (mechanical) shark in Never Say Never, a great movie location to visit on a luxury yacht. Divers exploring the underwater world of Lanai in Hawaii are rarely disappointed by First Cathedral site. An entrance archway leads through an underwater tunnel to a vast two-storey cavern, which stretches down to depths of 15.2 metres. The cavern was once a volcanic lava tube and offers plenty of passages, tunnels and ridges to investigate. Don’t miss the aptly named Altar, which is dappled by light on sunny days. Expect to see white tip reef sharks, spinner dolphins, butterfly fish and turtles. 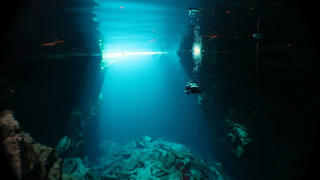 Bizarrely, leaving the cave is often the favourite part of the dive for thrillseekers. Sometimes called the torpedo or shotgun tube, divers time their exit from the cave with the surge and shoot out via a small opening at the back of the site. Divers exploring the underwater world of Lanai in Hawaii are rarely disappointed by First Cathedral site. An entrance archway leads through an underwater tunnel to a vast two-storey cavern, which stretches down to depths of 15.2 metres. The cavern was once a volcanic lava tube and offers plenty of passages, tunnels and ridges to investigate. Don’t miss the aptly named Altar, which is dappled by light on sunny days. Expect to see white tip reef sharks, spinner dolphins, butterfly fish and turtles. 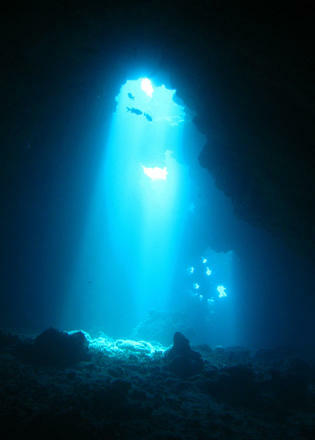 Bizarrely, leaving the cave is often the favourite part of the dive for thrillseekers. Sometimes called the torpedo or shotgun tube, divers time their exit from the cave with the surge and shoot out via a small opening at the back of the site. Situated under the limestone cliffs of the north western coast of Sardinia, the Nereo Cave (Grotta di Nereo) offers divers a myriad of tunnels, air chambers and archways to explore. Thought the be one of the largest marine caves in the Mediterranean Sea, Nereo Cave can be found just 100 metres north of the famous Neptune’s Grotto. With depths of up to 35 metres and approximately 10 different entrances, divers can complete a circuit around the cave’s passages while observing barracudas, red snappers, lobsters, groupers, moray eels and a rainbow of corals. Situated under the limestone cliffs of the north western coast of Sardinia, the Nereo Cave (Grotta di Nereo) offers divers a myriad of tunnels, air chambers and archways to explore. Thought the be one of the largest marine caves in the Mediterranean Sea, Nereo Cave can be found just 100 metres north of the famous Neptune’s Grotto. With depths of up to 35 metres and approximately 10 different entrances, divers can complete a circuit around the cave’s passages while observing barracudas, red snappers, lobsters, groupers, moray eels and a rainbow of corals. 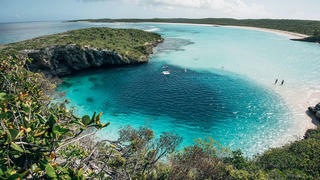 Dean’s Blue Hole is located off the coast of Long Island in the Bahamas. Technically a sinkhole, this underwater cavern is home to turtles, rays, snapper fish, seahorses, tarpons and an array of other colourful fish. As the deepest salt-water blue hole in the world, the 202 metre cave is popular with scuba divers, snorkelers and free divers. At 20 metres there’s a large cavern to explore that extends out to a width of approximately 100 metres. In 2015, William Trubridge was filmed free diving the world's deepest blue hole — he reached an astonishing depth of 101 metres without flippers or diving equipment. Dean’s Blue Hole is located off the coast of Long Island in the Bahamas. Technically a sinkhole, this underwater cavern is home to turtles, rays, snapper fish, seahorses, tarpons and an array of other colourful fish. As the deepest salt-water blue hole in the world, the 202 metre cave is popular with scuba divers, snorkelers and free divers. At 20 metres there’s a large cavern to explore that extends out to a width of approximately 100 metres. In 2015, William Trubridge was filmed free diving the world's deepest blue hole — he reached an astonishing depth of 101 metres without flippers or diving equipment. The Riviera Maya in Mexico offers a huge network of extraordinary caves for divers to explore, ranging from tame to treacherous. Three of the longest underwater cave systems discovered stretch out through the jungles near Tulum — Sac Aktun, Ox Bel Ha and Dos Ojos. The latter, meaning ‘two eyes’, boasts two caves, one of which is filled with sunlight while the other boasts a dark series of passages. 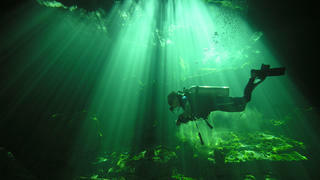 Divers can explore its stalactites with underwater flashlights. With more than 100 different entrances and plenty of caverns still undiscovered, the cenotes is one of the best adventurous destinations to visit by superyacht and home to a huge variety of marine life, historical sites and extraordinary rock formations. The Riviera Maya in Mexico offers a huge network of extraordinary caves for divers to explore, ranging from tame to treacherous. Three of the longest underwater cave systems discovered stretch out through the jungles near Tulum — Sac Aktun, Ox Bel Ha and Dos Ojos. The latter, meaning ‘two eyes’, boasts two caves, one of which is filled with sunlight while the other boasts a dark series of passages. 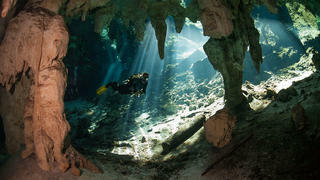 Divers can explore its stalactites with underwater flashlights. With more than 100 different entrances and plenty of caverns still undiscovered, the cenotes is one of the best adventurous destinations to visit by superyacht and home to a huge variety of marine life, historical sites and extraordinary rock formations.